For six consecutive years Huawei’s devices has been recognized for being advanced, innovative and technically superior. 15 August 2018, Dubai, United Arab Emirates: Huawei Consumer Business Group (CBG) today received an award from the European Image and Sound Association (EISA), a group comprising 55 of the world’s most respected consumer electronics magazines. 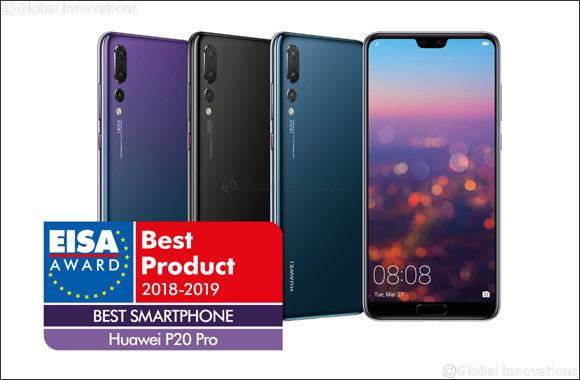 The HUAWEI P20 Pro was named “EISA Best Smartphone 2018-2019” by the association in recognition of Huawei’s commitment to quality, design and performance, as well as the company’s long track record of introducing stylish, powerful and winning devices. This is the sixth consecutive year that Huawei has been recognized by the EISA. “For us the most important reward is creating products that let consumers enjoy and experience intelligent and photography through our devices. The HUAWEI P20 Pro provides a wealth of photography features to help capture and share the moments that mean the most to our users,” said Li Changzhu, Vice President of Handset Business for Huawei Consumer Business Group. The revolutionary Leica Triple Camera on HUAWEI P20 Pro boasts the highest total pixel count among all smartphone cameras in the market today. In addition, it supports 3x optical zoom and 5x hybrid zoom, plus innovative features including HUAWEI AIS (AI image stabilization). The sleek design of the HUAWEI P20 Pro features barely-there bezels and all-new gradient colours. The device is enabled with the unprecedented AI-powered chipset that delivers a fast and smooth user experience. The premier camera features allow for a superior low-light photography experience, making it one of the few devices capable of shooting long-exposure photos clearly without a tripod, owing to Huawei’s proprietary AIS technology. In addition, the 4,000mAh battery puts the HUAWEI P20 Pro among the smartphones with the largest battery capacities. Taken together, the HUAWEI P20 Pro represents “a winning combination of great hardware, optics and craftsmanship,” noted EISA. EISA members include expert media across the full spectrum of consumer electronics from 27 countries, and each member contributes to one or more of EISA’s six Expert Groups namely photography, mobile devices, Hi-Fi, home theatre audio, home theatre display & video, and in-car electronics. Every year, EISA members nominate a list of products that they consider the standout performers in each of these Expert Groups. Nominations are then presented at EISA’s AGM, where members conduct an in-depth deliberation before voting for the winner of each category.